Who wouldn’t want their own lobby gorilla, bedroom bison or office penguin? If you’re looking for some special animal home décor, or the perfect gift for the nature fans in your life, then look no further than the huge range of goodies offered by my pals at Safari ltd! Safari’s been producing top quality hand painted animal replicas for over 30 years and they’re just getting started. If there is a type of animal that you are interested in, the chances are fantastic that Safari has at least one of your all-time favorite creatures for sale. 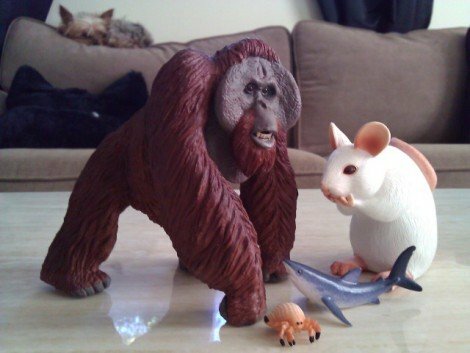 Orangutans are one of my personal favorite animals, and I was blown away at the beautiful Bornean Orangutan I received from Safari’s Wildlife Wonders series. The piece is large, highly detailed and sturdy, but soft enough for kids to safely play with. 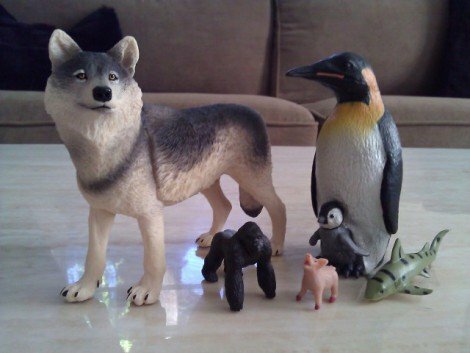 The Wolf is also from the Wildlife Wonders series, which includes a host of zoo classics, including the White Rhinoceros, Okapi and a brand new Cheetah model. Not all of Safari’s replicas are as huge as the ones mentioned above; Their series of Toobs are filled with quality reproductions of certain animal families. 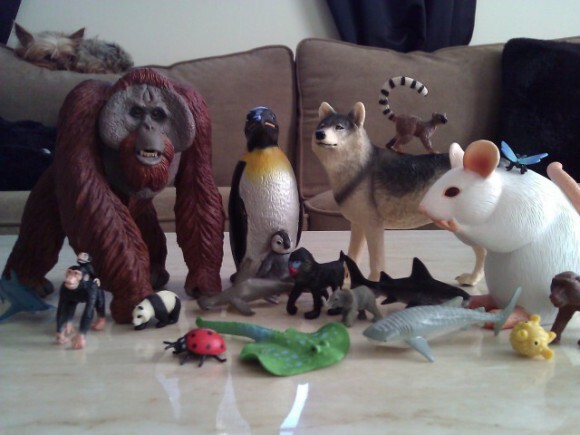 I’ve got several members from the “Sharks” and the “Monkeys and Apes” Toobs on display for you here, and as you can see, as compact as these animals are, you can still note the high level of craftsmanship in both their paint jobs as well as their cast molds. If you’ve always wanted to bring some of nature’s wildest creatures into your home of office, click here to adopt your own desktop beasts and to see what else Safari ltd has in its ever-expanding zoo of high-quality animal replicas. Safari gets my seal of approval for the greatest animal toys out there, bar none! Be Careful. They Look Cute, But... The Animal Video Of The Day!! !